Atomic Hawk 130 Orange & black Excellent for a confident skier that likes speed! Collection and cash welcome. Lange RS130 FIS Race Ski Boots. 316mm, 27-27.5 Mondo. 8.5 UK (9 UK race fit). Used Lange FIS RS 130 Race Ski Boots. 27-27.5 Mondo sizing = UK 8.5. I am a UK 9.5 and wore for racing. Used for one and a half race seasons. Scuffs and marks as you would expect. Full Tilt First Chair 10 are the stiffest boots in the Full Tilt Catalog so for the Advanced/Expert Skiers who want a strong, hard-charging, All-Mountain Boot. Full Tilt First Chair 10 (Size 28/28.5). Salomon Ski Boots size 30.5. Used by son for 1 week only last year He is now going to kit himself out for ski touring hence sale. V.g.c. Model - X Pro 100. Thanks for looking. These boos have been tremendous still in amazing condition and great for someone getting going ive just moved up to the next level thats all...so comfy Salomon QST Access 90 Ski Boots Size 7.5 Uk Size 26.5 Mondo. Condition is Used. Dispatched with Royal Mail 2nd Class. Salomon X Pro 100 Ski Boot 29.5. Basically brand new worn for a week. Still have the box. Any questions just message. Dispatched with Royal Mail 1st Class. Atomic Ski Boots. Mondo 295mm Condition is Used. Dispatched with Royal Mail 2nd Class. These boots are quiet scuffed on the exterior but in good condition inside. Condition is Used but good as new. An excellent pair of Rossignal Ski Boots, that are in good condition and appear to have been lightly used. The pair do not show signs of major scuffing, marking, or have any stains or odours. These have likely been worn once as there are light dirt markings on the sole. Otherwise in good condition and come in their original waterproof travel bag, which has slight marking on it but is in good condition. Please see photos. The impressively light Hawx Ultra 110 S version is the ultimate choice for advanced skiers. A Power Shift function adjusts forward lean to let you choose how to attack the hill and the Energy Backbone provides all the drive and power you'll need. Salomon ski boots Impact 8 (Energyzer 100) red, black and grey Mens 9-10UK size Mondo 28. Condition is Used. Dispatched with Royal Mail 2nd Class. The boots show the expected signs of wear but perform well with all buckles and straps fully functional. 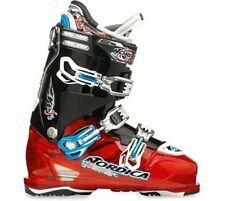 Great pair of starting boots for an intermediate all round skier. Reason for sale is my feet are changing shape and need some slightly bigger. Grab yourself a bargain and save the cost of expensive hire charges. Fischer RC Pro 120 Ski Boots 28.5 - 10/10.5. Condition is Used. Dispatched with Royal Mail 2nd Class. Used for one trip to La Plagne in 2017. Can no longer ski as wreaked my cruciate ligament. Selling off all my equipment. More than happy to combine postage. Please take a look and any questions please don’t hesitate to ask. Mens Salomon X pro 80 skiing boots size 29 in good condition with a few marks and scuffs. They were only used for 5 days of skiing. Pictures are of actual item. Any questions feel free to ask. Thanks for looking. Rossignol Ski Boots Sensor Blade size 26.5 = UK 7.5. Condition is Used. Dispatched with Royal Mail 2nd Class. These boots are obviously used but still very useable. Lining and clips undamaged. Lange RX 120 Ski Boots Mens Size 25.5 Anthracite Yellow. VGC. Lange RX 120 Size 25.5 in Anthracite Yellow. See pictures, especially the rubber soles for condition. If so then these are as good as new, so a great way to pick up a pair at significantly cheaper price ! TECNICA TNS EXPLOSION. YOU ARE VIEWING A PAIR OF SKIING BOOTS. SIZE UK 9.5/ EUR 44. Women’s ski boots, have been used. Selling as I got new boots last season. Any questions just ask. Great Salomon ski boots for older children / teenagers 4 clip boot with power strap Thermicfit boot liner These have been used by my children over the last few years and have grown out of them. Better than hire boots Will be sent via courier to reduce postal cost. They are classed as an all mountain ski boot with the benefit of a WALK mode which is useful for occasional touring. Fully heat moldable for a good fit. Sole length is 318mm, flex is 130 and last size is 100mm. Salomon 'Energyzer 95' boots. Unisex. Size 8. Good used condition- plenty of wear left. Comes with inner liner. Hi, For sale, I have a pair of Rossignol Ski boots in yellow, size 9. They were bought for one ski season but had been used previously, possibly as a rental pair, but are in perfectly used condition, Please feel free to ask any questions, Thanks. 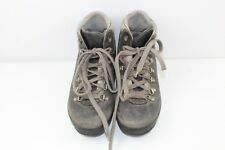 Women’s ski Boots Salomon evolution 8 Size 7. Condition is Used. Collection in person only. Used ski boots. These boots have been well used but are in good condition to do a few weeks skiing. Ideal alternative to hiring boots on holiday at a high price that may be uncomfortable. Good for practise/dry ski slopes etc to get used to them before a ski trip abroad. Liners in good usable condition, nice and warm with no obvious worn patches. Bindings are adjustable and in good working order. See photos for view of all angles including soles. Vintage Salomon SX62 Size 2 Ski Boots with Bag. Pre-owned. Vintage Salomon SX62 Size 2 Ski Boots with Bag. Pre-owned. There is a small slit in the base of the bag but it still performs it function (I have literally only just noticed when photographing). Should it both anyone my initials are on the bag but doubt difficult to remove or write over. Please be advised I am in holiday from 12th-28th April 2019 with no access to my eBay account so should you purchase the item I will be unable to dispatch until 29th April 2019. Pick up available from Stevenage. Full Tilt Drop Kick Ski Boots 2015 SIZE 30.5 UK 10/10.5. Condition is Used, Great Boot with absolutely loads of life left in them! Used for one season in St Anton this year. Dispatched with Royal Mail 2nd Class. Fischer Soma Viron 95 Mens Snow Ski Boots Men’s UK Size 9 With Hotronics Heating. Condition is Used. Dispatched with Royal Mail 2nd Class. * Color: White/Black/Chrome * Ski Walk Flip Lever * Full Thermo Fit Liner * Micro Adjustable Ally Buckles * Boot Heater Prepared and Hotronics installed with multi-level setting (rechargeable battery powered) * Soma Tec Fit Great pre-loved boots that are clean and odour-Free. Please expect usual wear and tear, including some damage to the Hotronics connection plug, though it’s full working. The liner has some damage too but again nothing that effects the performance in anyway. Any questions, please get in contact. Tecnopro Model T30 Childrens Ski Boots, Only Used For Two Weeks Size 20.5. Condition is Used but good. No damage. Colour is black/white/red. Unisex. I had same pair for both my kids and they are boy and a girl. Selling as they are now too small. Dispatched with Royal Mail 2nd Class.